When you think about it for a second, it’s amazing to see just how useful plants you can grow inside and outside of your home are for survival purposes. I’ve written about mint, aloe vera, moss and more, but I’m really excited to tell you about basil’s survival uses. Basil isn’t just a potent herb to put on pizza or mix into marinades. It’s a potent plant based source of a wide variety of nutrients you’ll have trouble finding elsewhere. I’m going to touch on 10 of the incredible benefits of this aromatic and flavorful herb and then show you the easiest way to grow it at home or in your garden. Here’s the thing about cancer and survival situations. Scientists are proving over and over again the rise in cancer has a lot to do with environmental reasons. Toxins, stress, chemicals, etc. Basil has been shown to fight the formation of cancer because it helps to protect your cells from mutating which eventually can cause cancer. By eating basil both now and after a SHTF situation arises you’re helping protect your cells from DNA damage which might eventually lead to cancer. Clinical studies published in Nutrition and Cancer also show that it contains phytochemicals, which can help naturally prevent cancer, including chemical-induced skin, liver, oral and lung cancers. Basil is able to increase antioxidant activity, positively alter gene expressions, induce cancerous-cell apoptosis (death of harmful cells) and stop cancerous tumors from spreading. Another amazing benefit of basil is it has the proven ability to help kill dangerous viruses, pathogens, molds, yeasts, and bacteria. Researchers were able to show when the essential oil of this plant was tested against deadly bacteria like E. Coli and other bacteria it prevented the bacteria from growing any more. They concluded basil could be highly effective against antibiotic resistant “super-bugs,” which is great news for anyone who doesn’t have access to antibiotics in a crisis situation. There are several ways to use it for antiseptic purposes. To clean surfaces start by crushing the leaves and stem and then rubbing the crushed plant on a questionable surface. For wounds you can crush it and apply it to the injured area. And if you’re able to store some of the essential oil on hand then you can use it in the same way. Stress in a survival situation is expected. With all of the craziness that comes in a crisis your body will naturally try and deal with stress and this coping mechanism can actually cause harm to your body at the cellular level. Basil is an adaptogen, or an herb that protects cells from stress. And when you eat the herb it’ll naturally help your body deal with stress so you don’t get sick, and so your body doesn’t become damaged from the stress. This is one of those things you don’t really think about when preparing for crisis. But depression is something you want to be prepared for because depression can really change the outcome in a survival situation. So how does this aromatic green leaf keep this awful condition at bay? Basil has the ability to affect the part of the brain which controls the neurotransmitters associated with brain health. The area it works on specifically is known as the adrenal cortex (where adrenaline is produced) and the herb helps to regulate the amount of adrenaline and other hormones in the body so you’re left happy and healthy at the end of the day. A great reason to include this herb in your diet both now and post disaster is because it can do wonders for your cardiovascular system. It shouldn’t take much to convince you this is really helpful after the SHTF. Basil does something really unique for heart health. The way it works are several fold. First we know it can help the blood vessels contract and relax with greater efficiency. This can help get your blood pressure in the healthy range. It can also keep your blood cells from clumping together which causes dangerous blood clots which can lead to clogged arteries and eventual heart attack. One of the other ways it helps heart health is by fighting inflammation. Inflammation is deadly as it can have negative effects on many of your body’s organs and functions. The leafy green herb has antioxidant properties which resist the negative effects of inflammation and help your heart do its job better. As I mentioned in the section above this leafy green herb can help fight inflammation. The reason why is because it’s a known antioxidant, and antioxidants are some of the most incredible substances known to man. Antioxidants help fight inflammation and protect your DNA at the cellular level. Specifically they work to fight the effects of things known as free radicals. Even as we speak free radicals are abundant in the world…they’ll likely be around in greater numbers during a crisis situation. Both environmentally and as a result of the stress your body experiences. This herb’s got two incredible antioxidants known as orientin and viceninare. These antioxidants help your immune system work better to help fight inflammation and also protects your DNA from mutational effects. Both of which significantly help keep you safe. This is one of those benefits that plays a significant role in good health now as well as during a survival situation. You need healthily regulated blood sugar levels for a ton of reasons. Probably one of the biggest ones is so you don’t need to depend on injected insulin to stay alive. Simply put the herb can help bring blood sugar into the healthy range. If you’re diabetic, or pre-diabetic it can help with your condition. The reason why is researchers have shown basil can produce improvements on blood glucose as well as helping improve cholesterol levels which means it has a therapeutic effect for people with those conditions. Detoxification is incredibly important both in pre-crisis life and post-crisis life. The reason you’ll want basil on hand for post-crisis situations is your body will be dealing with many, many more toxins than it normally does because of the increase in stress and environmental toxins you’ll be forced to deal with. Obviously no one wants a headache…but imagine how bad a headache would be in the middle of a crisis situation. Basil has the remarkable property of being antispasmodic, meaning it can reduce spasms. Many times headaches are a result from spasms in the neck muscles and ingesting basil orally whether in a tea or just eating it will help loosen up those tense muscles and promote relief. Basil has the ability to reduce painful indigestion, gas, reduce nausea and help out with other stomach problems. This makes it a great herb to keep in your survival garden. 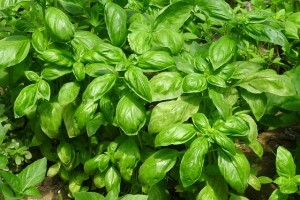 Essentially basil acts as a colic and has a carminative effect (this means it stops gas, or forces it out). That means if you’re ever feeling overwhelmed by a digestive problem then it can really help. Imagine how much that’s going to help in a crisis situation. 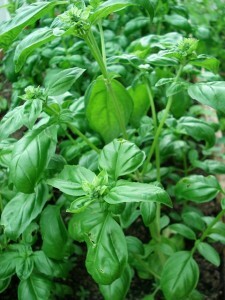 Growing basil at home is quite easy, even in the winter time. Using aquaponics systems (see my article on aquaponics here) you can grow basil inside all year long. 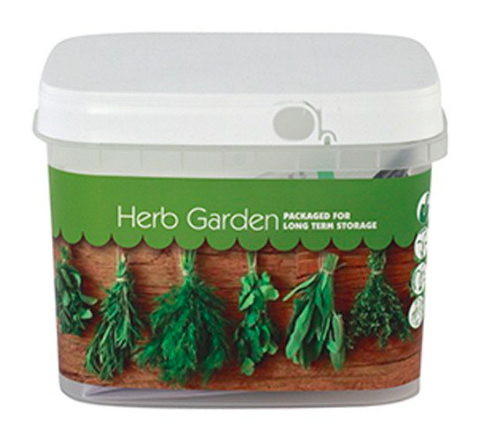 If you’re looking for a go to solution for all you survival herb needs then you’ll love our herb garden bucket of survival seeds. This amazing package comes with 50,000 + seeds of some of the highest quality herbs on the planet. And? It costs less than a nice dinner. This entry was posted in Emergency Preparedness, Family Survival, Homesteading Tips and tagged basil, best survival foods, survival food on November 10, 2015 by Survival Frog.